Day 1: Planning to meet at the airport at 3 am, we all had an early wake up call. Aside from the yawns, it was obvious that each of us was filled with excitement and anticipation for the week ahead. After a long day of travel, we landed in Panamá city around 7 pm. Everyone was tired but we were in awe that we had finally arrived! The humidity hit us like a truck as we headed to load our bags on the bus that would take us to our hostel. Although we wanted to hang out all night getting to know each other, we crawled into our beds and tried our best to fall asleep. Day 2: After a comforting and familiar breakfast of cereal and toast, we once again hopped on the bus, but this time headed to our Panamanian home for the week- Ciricito Arriba. The ride there was fairly long, three hours to be exact, but that gave us lots of time to see the beautiful city and countryside of Panamá. We saw the Panamá City skyline, the famous Panamá Canal, and we even pulled the bus over to let a very slow sloth cross the road! Finally we arrived at the community of Ciricito Arriba and began to set up camp. After unpacking and applying more sunscreen and bug spray, it was time for our first meal with the gente (people) of Ciricito. They prepared us a delicious meal called Arroz con Pollo (rice and chicken) which we learned to be a traditional dish to serve during celebrations. With full tummies, we slept under colorful mosquito nets, excited to start building the court the following day. 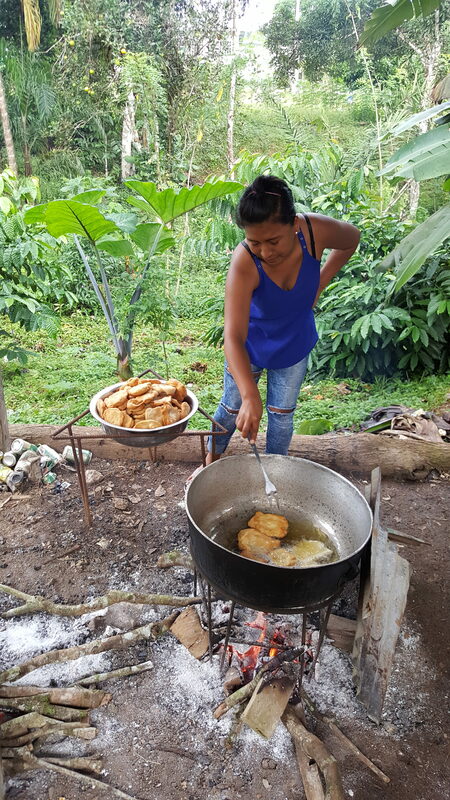 Day 3: Our first morning was off to a great start after eating the scrumptious huevos revueltos (scrambled eggs) and warm yuca, a delicious root vegetable. 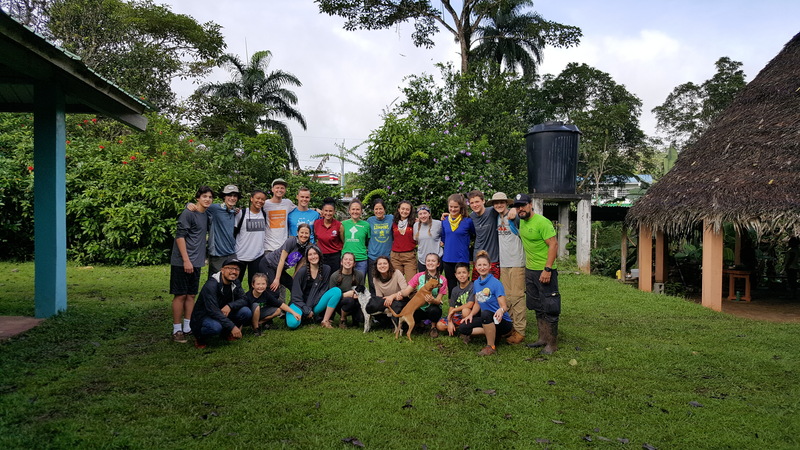 Energized by steaming cups of organic coffee, grown and harvested by the community of Ciricito Arriba, we were awake and ready to get down to business! 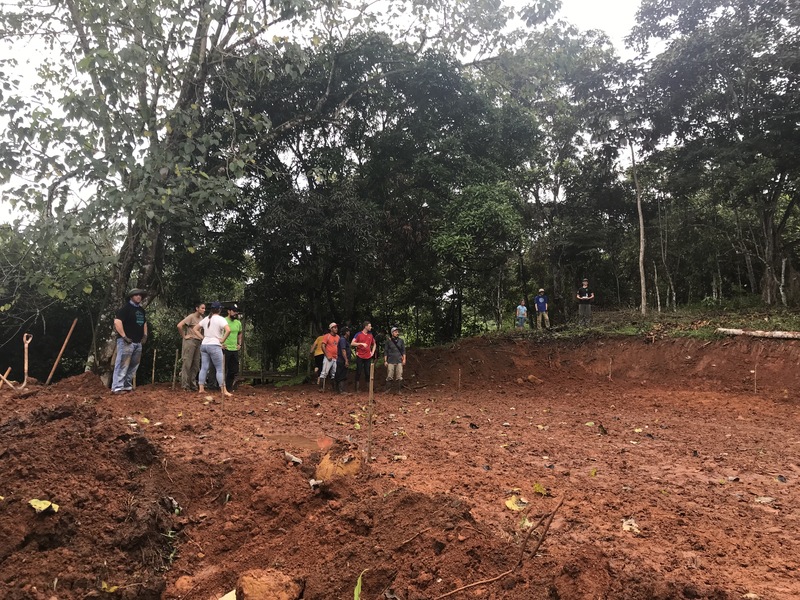 Our first task was to start moving the supplies and materials up the loma (hill) where we were going to build the sport court. By the end of the morning, we filled and moved exactly 279 bags of sand up the loma, using the effective and collaborative “human chain” method. Team work really does make the dream work! By lunchtime the rain had rolled in, a pattern we quickly noted and became accustomed to. 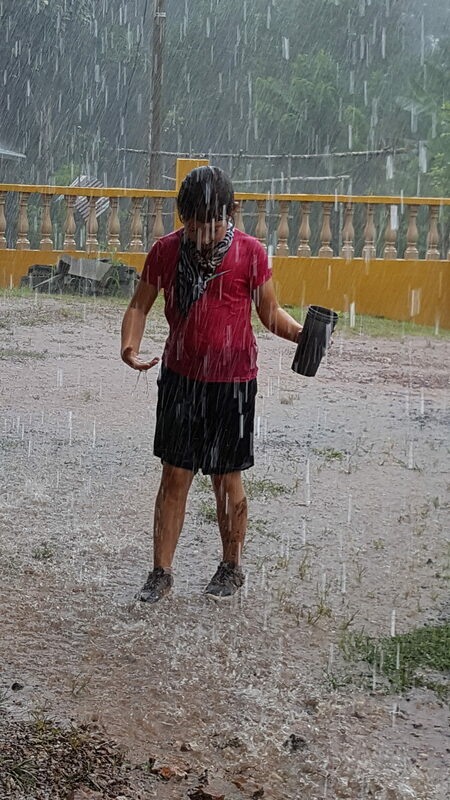 While waiting for lunch to be ready, our kids and the local children passed the time by dancing and playing in the rain. After a long and productive day of work, we moved our belongings to the local school where we stayed for the rest of the week. Day 4: The plan for the day was to continue moving supplies up the loma to the court. Finally we got the rest of the sand up the loma and started to measure and level the court site, yay! While working, we were greeted by a lovely thunderstorm that turned our dirt court site into a massive mud pit. Despite the weather conditions, our team powered through and did the best we could, ending the work day with a celebratory mud fight. At dinner time, the Peace Corps volunteers, who helped us with the court the entire week, lead a fun tournament style game of Rock, Paper, Scissors for the whole group. We ended the evening learning from the locals about the coffee industry in Ciricito Arriba and surrounding communities. It was truly enlightening to learn more about the community and their economy. Their pride and passion for their industry were humbling and touching. After learning more about the hard work they do to produce their coffee, the cups we drank each morning seemed to taste even better. Day 5: The day started, once again, with a delicious breakfast. This time, fry bread and savory salchichas (sausages). 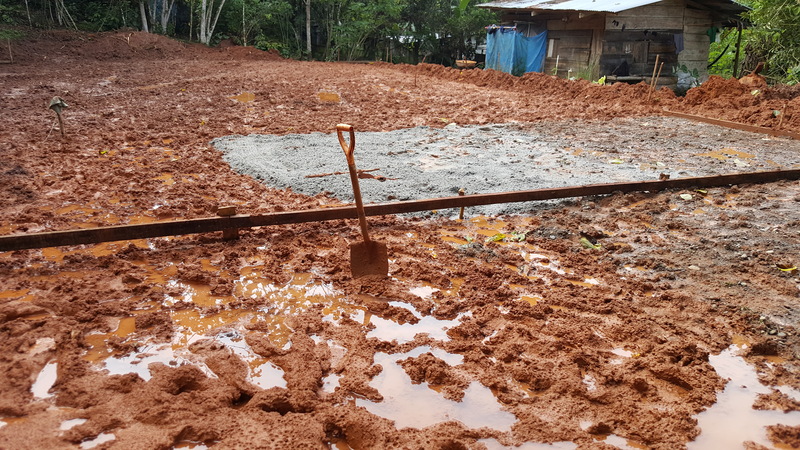 Because of all the rain in previous days, our court site had turned to pure mud. 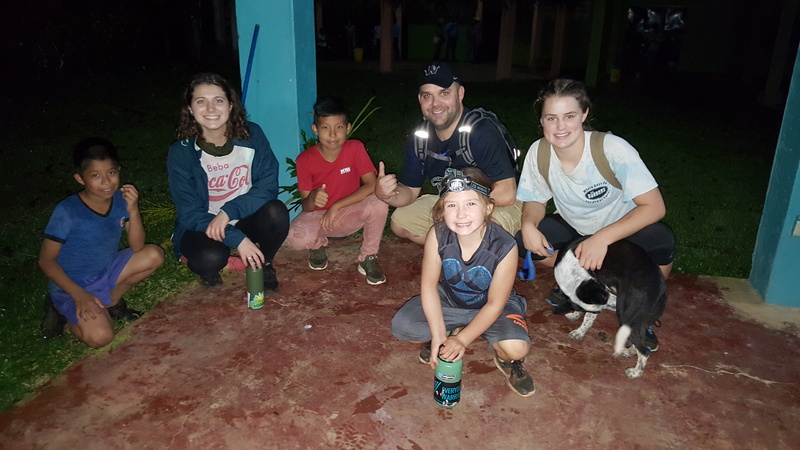 Thanks to the group’s flexibility, we took advantage of a day off of work and were able to explore the community of Ciricito. Throughout the day we went on a beautiful hike to the nearby river and played soccer with the local youth. It was a relaxing day of fun and gave us the opportunity to grow closer as a team. We ended the day with a warm bowl of spaghetti and learned about the history of Ciricito. The locals passed around a couple of pictures of their community back in the 1950s and talked about how their pueblo (town) has changed over time. We ended the evening with a QA session where we got to ask each other more personal questions. It was the perfect end to a day of cultural exchange. 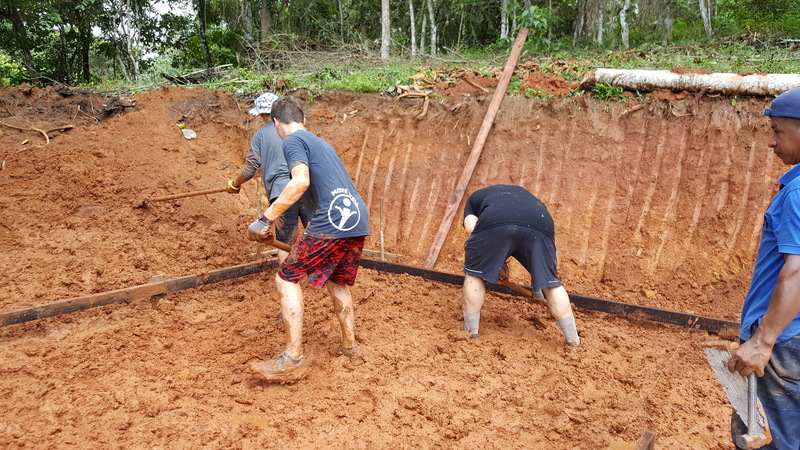 Day 6: Waking up excited to get back to work on the court, our flexibility was once again put to the test… we discovered early on that the power had gone out in the whole community and most of our work plans were put on hold. We were waiting for some machines and in need of electricity, so day six quickly became another day of cultural exploration. 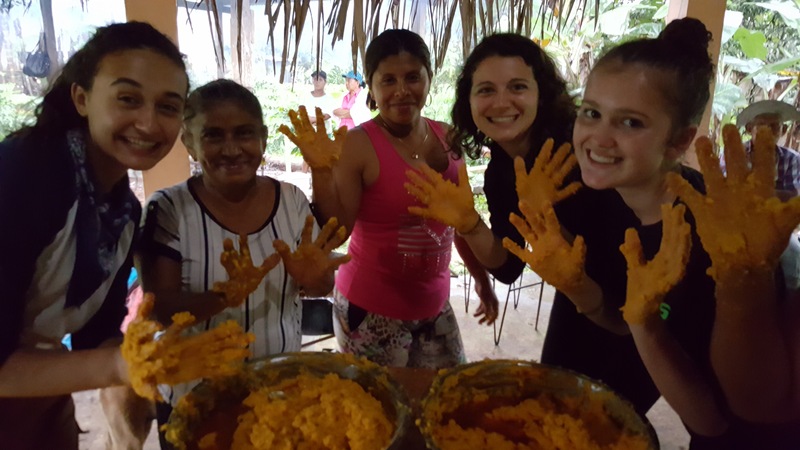 The locals taught us how to make tamales, a popular dish in countries all over Central and South America, each country taking on their own version. 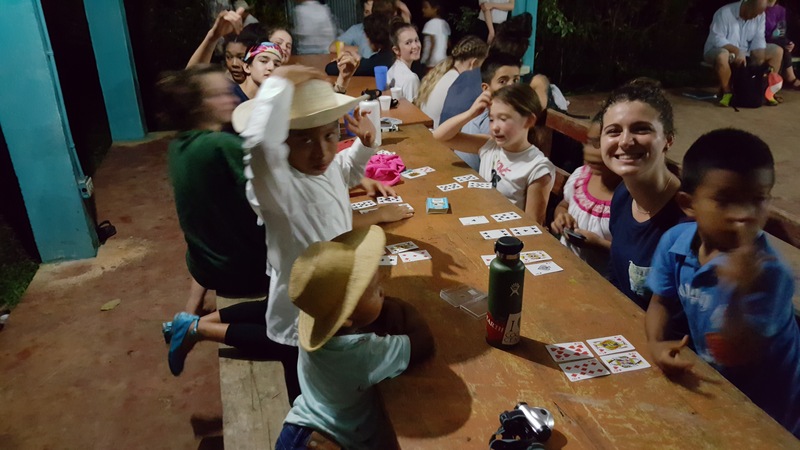 Playing cards quickly became a form of entertainment, so we passed the day teaching the local children how to play various card games. Being the Thanksgiving holiday back in the U.S., it was fitting to spend the day playing and being together. 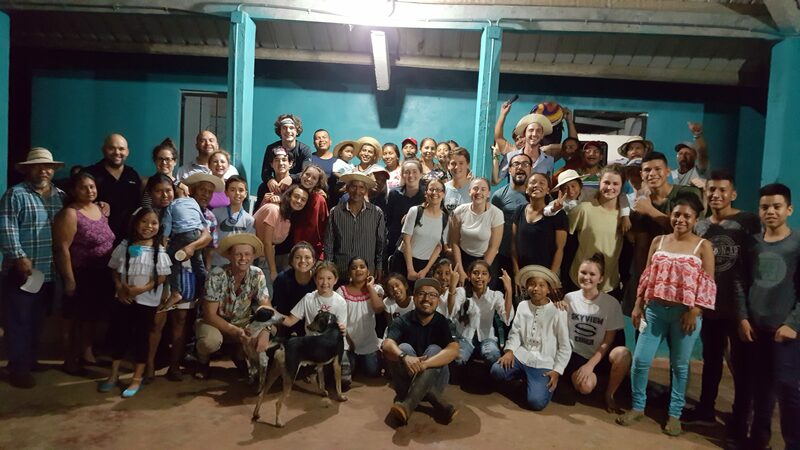 Each of us brought some instant Thanksgiving food so that we could make a big Thanksgiving dinner for the people of Ciricito Arriba. In the dark, using cell phones and flashlights, we cooked and shared a special part of our American culture with the locals. It was indeed a very touching and memorable evening for everyone. Plus the electricity even ended up coming back on in the middle of our Thanksgiving feast… perfect timing! Day 7: Today was our last full day in Ciricito Arriba, and to say things were bittersweet would be the understatement of the century. 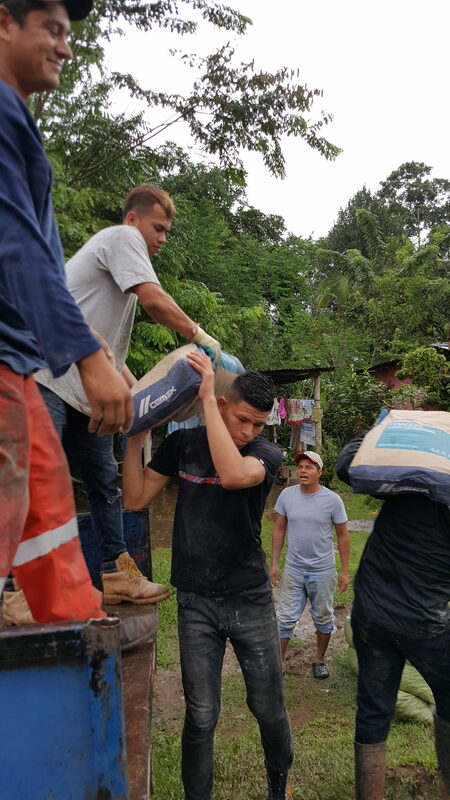 It seemed as if everyone wanted to make the most of our last day, and with some more roadblocks in the way of building the court, we got our time to play and connect with the people of Ciricito. During the students’ recess time we taught them how to play volleyball, another soccer game took place on the school field, and we were able to attend an annual community event where various organizations informed community members of the happenings in the country and surrounding areas. We ended the day with a simply incredible celebration of touching speeches, beautiful songs, and uniting dance. After such an impactful week of getting to know each other and different cultures, this party was the perfect way to share love, give thanks and give a proper goodbye. Day 8: We woke up early, our last morning in Ciricito Arriba, and had one final breakfast with some of the people we had deeply and genuinely bonded with. Loading up the bus, we said our goodbyes. Although we were sad to be leaving, we had a fun day planned to explore Panamá City, which was a great way to end our trip. We visited the Panamá Canal and Casco Viejo, the colonial part of Panamá City. After a long week, it was relaxing to do some exploring in another part of Panamá. We ended our trip back at the same hostel where we stayed our first night. Eating Domino’s pizza and reflexing over our experiences and time in Panamá, the room was filled with love and appreciation for each member of our team. 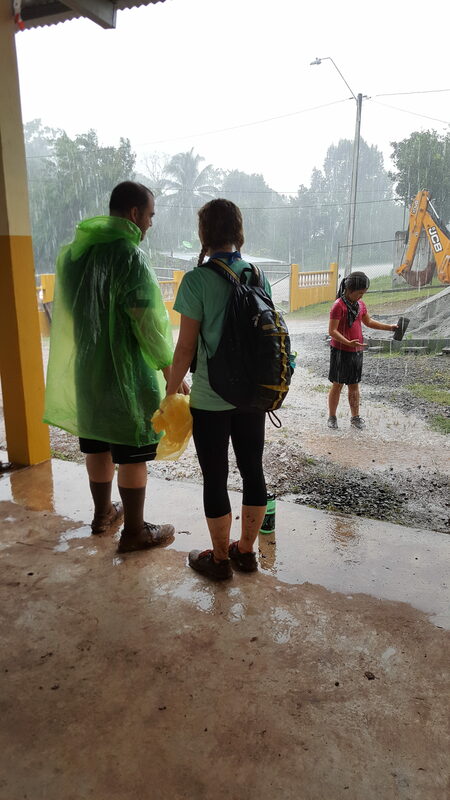 Although our time in Panamá and Ciricito Arriba was short-lived, it was a memorable and life-changing experience for everyone involved. Viva (live) Panamá, viva the United States, and viva Courts for Kids!